How much Americana can you fit into a weekend? Amanda and I decided to do our best this Memorial Day weekend. We started Friday evening after spending about an hour assembling our new grill (the new apartment building allows what our own condo association wouldn’t — ironic, right?). 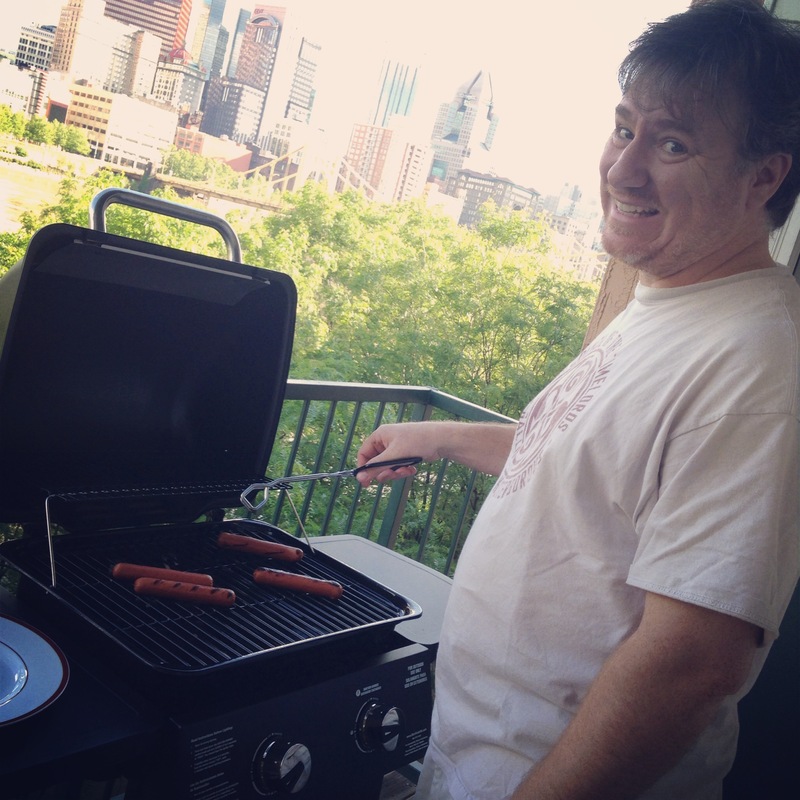 Zeke grills up some hot dogs with a view of downtown Pittsburgh. I fired up the propane and tossed some hot dogs on the fire, I take mine with just ketchup and she likes to add mustard. The home-made hot dogs and some beer (based on a colonial recipe the founding fathers likely had), hit the spot. PNC Park, home of the Pittsburgh Pirates, sits just one block away from our Pittsburgh digs. We were gifted some tickets from a friend and decided not to pass up the chance to indulge in America’s Pastime. The seats were some of the best major league seats I’ve had a chance to enjoy, in approximately 80 feet from the first base line. We were right behind the visitors’ dugout so we had a prime view particularly when the Washington Nationals walked in and out of the dugout in their red, white and blue. The weather was nice, a little cooler than we’d prefer, but it wasn’t too bad. Lower left: a friend sent us a picture – apparently we made it into the TV broadcast and the announcers mentioned Amanda’s Caps attire. The next morning we went with one of our favorite pastimes, sleeping in. I never get the chance to sleep in so when I realized it was almost 10 a.m. it was shocking. An action movie was next on our list. We found a new theater to visit, a big one – the biggest we’ve visited. A short 2 hours and 11 minutes later we emerged from the theater filled with popcorn and pop. I don’t know what it is, but something about big screen explosions makes me want to gorge myself on junk food. The evening is going to be filled with my favorite spectator sport, hockey. Hey it’s from North America. 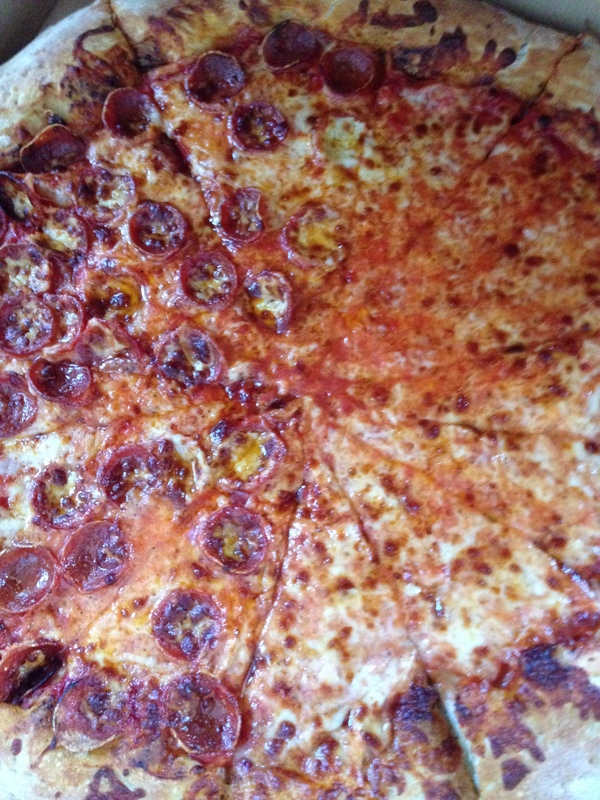 I’ll top off that popcorn and soda with a slice or three of pizza, which is a true American food (trust me, if you’ve been to Italy you know we do pizza better here). I’m not sure what’s next in our Americana weekend, but I think a road trip might be in order before work on Monday.